The aim of this research is to obtain the effect of chitosan addition on the properties of biodegradation and water uptake for bioplastics. Bioplastic is made from mixing corncob powder and chitosan using by gliserol as plasticizer. Bioplastic is synthesized for gelatinization temperature of 80oC. Chitosan addition is varied to 2, 4, and 6 g. Based on the analysis, the addition of chitosan can significantly decrease water uptake of bioplastic. The lowest percentage of water uptake was 8.59 % by addition 6 gr chitosan. The highest weight loss percentage of bioplastic was 88,42 % which is obtained by the addition of 2 gr chitosan heaped for 15 days in soil. This indicates that the bioplastic has the high biodegradation properties. Also, the result of FTIR analysis indicated presence of O-H and N-H groups of bioplastics due to the addition of chitosan and glyserol, but their instensity experienced falling down and shifting at the wave numbers after stockpiled. Coniwanti, P., Linda, L., dan Mardiyah, R., A. (2014). Pembuatan Film Plastik Biodegredabel dari Pati Jagung dengan Penambahan Kitosan dan Pemlastis Gliserol. Jurnal Teknik Kimia, 20(4), 22-30. Ginting, M.H.S., Tarigan, F. R., Singgih. A. M. (2015). Effect of Gelatinization Temperature and Chitosan on Mechanical Properties of Bioplastics from Avocado Seed Starch (Persea americana mill) with Plasticizer Glycerol. The International Journal Of Engineering And Science (IJES), 4(12), 36-43. Pointner, M., Kuttner, P., Obrlik, T., Jäger, A., Kahr, H. (2014). Composition of Corncobs as a Substrate for Fermentation of Biofuels. Agronomy Research, 12(2), 391–396. 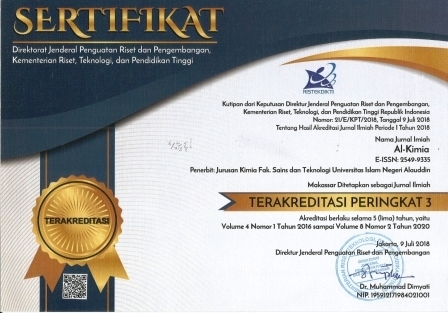 Puspita, N. F., Altwaya, S., Mawarani, L.J., Ayu, D., Rosita, D. (2015). The Effect of the Addition of Glycerol and Chitosan in the BiodegradablePlastics Production from “Porang” Flour (Amorphophallus muelleri Blueme). Proceedings of The 9th Joint Conference on Chemistry, ISBN 978-602-285-049-6. Vlacha, M., (2016). On the efficiency of oleic acid as plasticizer of chitosan/clay nanocomposites and its role on thermo - mechanical, barrier and antimicrobial properties- Comparison with glycerol. Food Hydrocolloids. (57). 10-19.